The Ins and Outs of Straightening Hair Extensions. There are now close to 10 different fusion types. These range from tape-in, flip-in, halo, micro loops and so many more. Despite that, clip in hair extensionsare still one of the most used methods! Why? Because they’re very affordable, simple to use, and produce amazing results. Whether you want to use them every day or only for special occasions, clip in extensions are one of the best ways to achieve instant length, boost your volume, and create a very trendy look. 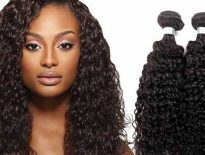 If you have bought high quality Remy hair extensions, that means you can curl them, straighten them, and even dye them. But all of those must be done very carefully and not too often. Otherwise, you risk damaging your new extensions. If you take care of them and follow all of the maintenance tips, you can significantly increase the lifespan of your hair and be able to wear it for a long time. So, if you have curly extensions or simply want to change the style, you’re probably thinking about straightening them. Although hot tools should be used as little as possible, they are still the only and best way to straighten your strands! But there are some things you can do, in the instances when you must use a flat iron. That will protect your locks and minimize any damage. Now, if you’re wondering how to straighten hair extensions, look at this simple guide. First, you need to decide whether you want to straighten your wefts while they’re attached you your locks or separately. Both ways work great, it’s just about what you find easier. When clips or tapes are attached to your strands, then you must straighten all your locks, but you can also do it just on the extensions. 1 How to Straighten Hair Extensions Separately? How long you spend on hair extensions really depends on hair texture. Did you get weave, curly or other type of hair? Have you decided to do straighten your strands separately? In that case, find a place to hang your wefts. A regular clothes hanger can do the job or something similar. It is a good idea to wash your wefts first because there’s no point in washing them after the straightening process. When your wefts are completely dry from washing, take a comb and brush them thoroughly so there’s no knots or tangles. Before you apply the hot tool, you need to protect your wefts from the heat. To do that, apply a heat protectant spray on each one and let it dry. They are very cheap, and you can find them in many stores. If you use a gel one, simply apply some to your hands and run them through the wefts. Start with the largest weft first and clip it on your hanger. Turn on your flat iron so that it heats up. Section off a smaller piece of your big weft, approximately the width of one clip or tape. Take the flat iron and run it through, from the top to the bottom. Do it slowly and if your hair has been curled before, it might take a few runs to make it completely straight. Do this with all the sections of the big weft. Repeat step six on all of the other wefts and you’re done! Now your hair extensions are perfectly straight and you get a completely new look! 2 How to Straighten Extensions Attached to Your Hair? Although this method takes a bit more time, since you have more strands to deal with, it produces great results. Mostly because it also blends your natural locks with the extensions better. So, if you’re going for that seamless look, try this way of straightening. First you need to wash, dry, and finally brush your hair extensions in order to prepare them for the installation and straightening. Attach the extensions the way you normally do, and brush everything together once more. Again, you need to protect your locks, as well as the extensions from the heat. Spray some heat protectant or if you’re using a gel, apply some on your fingers and brush them through in order to distribute it all over. That will protect your extensions from any damage. Turn on your flat iron. While it heats up, you can section off your hair. The easiest way is to start straightening on the bottom. Separate a layer of hair just above your neck and clip the rest of it up so that it’s not in the way. Now separate that layer in two parts and bring it in the front so that you see what you’re doing. Take the first section from the left side and run the flat iron from top to bottom. If the strands are not completely straight from the first run, repeat it a few more times. Do the same for the right side. Repeat this process and section off layer by layer, going higher up. When you reach the top of your ears, start sectioning off the hair from one side going to the other. Now, take the first strand from your left temple and straighten it. Repeat the same process, moving to the right, until you reach the other temple. Make sure that all your locks are straightened and even. Your extensions should look natural and seamless. And that’s it, you’re done straightening human hair extensions! In order to protect your hair and increase the lifespan of your extensions, we recommend that you straighten it as little as possible. Don’t do it every day and always apply a heat protectant. Otherwise, your risk damaging your wefts by the heat and they will not last you as long as you would wish. Also, if you’re not that skilled in using a flat iron, ask a friend to help you, or go to a salon to have it done professionally. 3 How to Straighten Hair Extensions without Hot Tools? If you are sensitive about your hair extensions and really want to make them for as long as possible, consider this method. It’s not as effective as flat iron one but should work for less textured hairstyles. Wash your hair extensions and dry them with a towel. Depending on total weight, it might be wise to use a hair turban. Apply a dab of hair smoothing serum. Don’t put too much. Try brands like Paul Mitchell or Oribe. Start brushing your extensions while hair is still weft and with tiny traces of serum. Turn on your blow dryer and put it on the cold setting. We recommend taking your wefts off before doing so. You don’t want to catch a cold! Be patient as you will have to brush your wefts until they are completely dry.